Thanks Martinardo, it's a lovely piece of counterpoint. Just for fun I put a light inside my '68 No. 7 and surprise! 7 fans plus a treble bar. Very nice Jon, looks identical to my '64 Kohno. What is the bracing like on your '64? Same? Actually I don't know, I have not checked my -64 - Let me come back on this. They do sound quite different though. The 64 is softer/sweeter and the 67 is more clear/bold. Got a rather large package sent to me today from Japan. 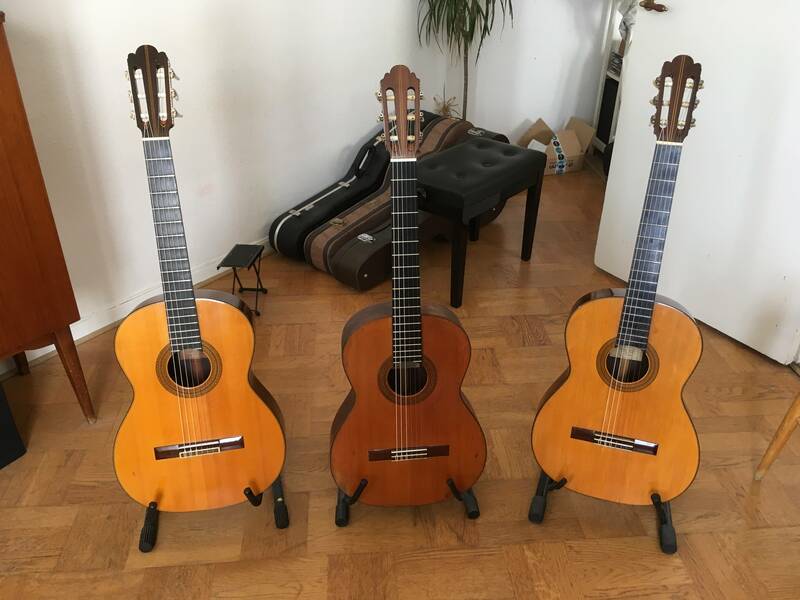 Three guitars, one Masaru Kono '61, one Rokutaro Nakade A4 '62 and one Matsuoka no 50 from '76. Should be here in the begining of next week, very exciting! Does anyone know what difference it makes to the sound if the strutting is fanning out in this pentagon fashion in contrast to the struts being perpendicular, like a rectangular shape, like in the 1987 concert model photo I posted? Do you have any sound or video samples of you playing the guitar? According to some the rectangular shape, or semi lattice, has more a more modern/piano like sound to it. But that is only half the story as the older instruments from the 60s and early 70s were lighter in construction too. The new instruments are also a little louder. Me for one appreciate a more "woody" old world/traditional tone. But then again, I'm not a performing professional. Nice. Did you use the consolidated shipping option? I thought they would not allow it for guitars. Yep, no problem whatsoever. Using zenmarket.jp. Will get the package on monday, will update if they got here safely. In customs atm in Sweden. 1964: Spruce top, Brazilian back and sides. 1967: Spruce top, Indian back and sides. 1964: Spruce top, Indian back and sides. They are all traditionally built and sound quite alike. But the 67 might be the "boldest" of them all, sounding like a wise old tree. It has been trough a lot in it's life. With that said, amazing guitars all three in their own unique way, and very very easy on the hands. Ohhh yeah John. The '67 spruce top is dark like cedar. What are the model numbers, nut width and scale length of your two 64 Kohnos? 3. 1964, 650/50 mm - "Model 3-2" - (No idea what it means, but it has much less decorations than my no.7) This model also has a "zero fret". Last edited by rinneby on Fri Apr 12, 2019 5:22 pm, edited 1 time in total.